i’m taking advantage of this gloomy, rainy day to develop some new sandwich recipes for my lunch box delivery business that i will be launching soon. i have some friends coming by tonight to munch away on my creations and give me their opinions. it’s not soooo bad to be my friend on days like this! in the bowl of an electric mixer fitted with a dough hook combine yeast with 1 tablespoon of sugar and warm water, let proof for 5 minutes. add brown sugar, butter, salt, mashed sweet potato and 2 of the eggs to the yeast mixture, stir to blend well. add the flour, 1 cup at a time. turn out onto a floured surface and knead for 2 to 3 minutes adding only enough flour to prevent it for sticking to the board. when the dough is smooth and springy, shape it into a ball. place in an oiled bowl, and coat the dough completely with oil. cover bowl with a kitchen towel and let sit in a warm place until it doubles in size, about 2 hours. 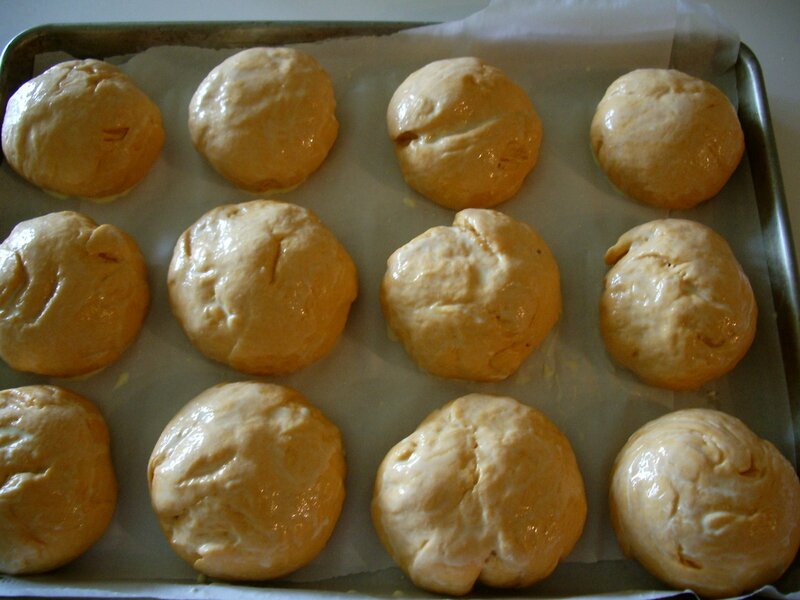 punch down the dough and shape into 12 balls. place them on a cookie sheet covered in parchment about 2 inches apart. cover and let rise until doubled in size. 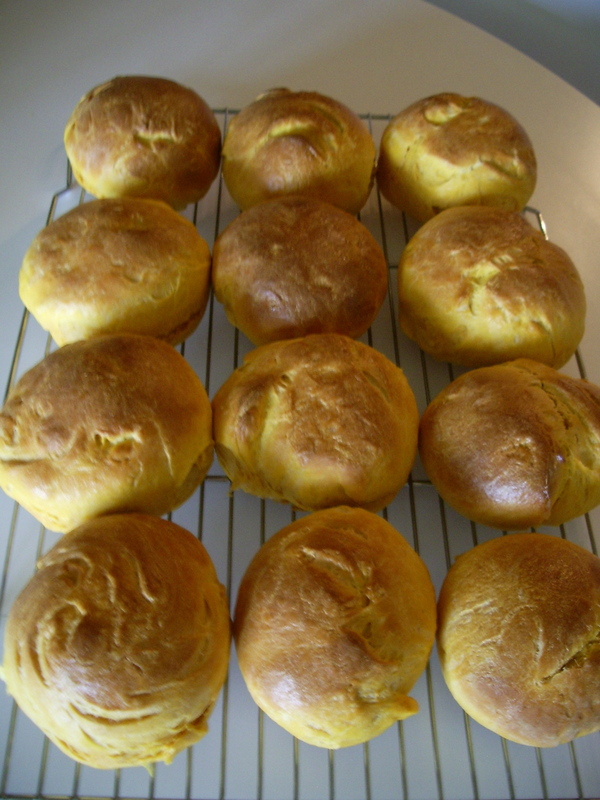 brush the rolls with the beaten egg and cream mixture. this is what the rolls look like before you bake them. this is what the rolls look like after they come out of the oven. add 1 cup flour to yeast, and mix on low until combined. add salt and remaining 4 cups of flour 1 cup at a time. beat on med-low until dough pulls away from the sides of bowl. turn out on floured board and knead until smooth and elastic. put in oiled bowl and turn to coat. cover with a kitchen towel, and leave in a warm spot for 1 hour, or until dough has doubled in size. punch down the dough and shape into 12 balls. place them on a cookie sheet covered in parchment about 2 inches apart. cover and let rest for 15 minutes. fill large, shallow pot with 2 inches of water. Bring to a boil. Add baking soda (it will foam up a little) and remaining 2 tablespoons sugar. Reduce to a simmer; transfer three to four rolls to water. poach 1 minute on each side. use slotted spoon to transfer rolls back to baking sheet. beat egg with 2 tablespoon water. brush rolls with egg glaze. sprinkle with salt. bake until golden brown, 12 to 15 minutes. let cool on wire rack, or eat warm. rolls are best when eaten the same day, but will keep at room temperature, uncovered, for two days. do not store in covered container or they’ll get soggy. 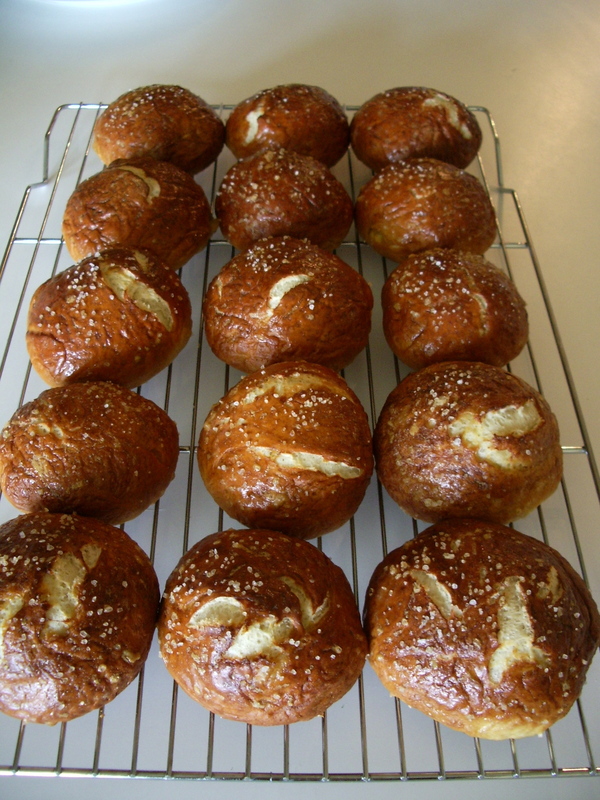 the pretzel rolls look amazing! i worked with a chef once who said that the most honest things a cook can make are bread and soup. i must be the most honest cook on the planet by now because those are the things that i make most often. enjoy baking bread and i’ll keep sharing my recipes with you. This entry was posted in breads, Recipes. Bookmark the permalink. Well, these all look amazing! Every time I “bake”….. I don’t do so well and you have inspired me to try again! Gals like you always make it look easy! Here I go again! those look delish — I wish you could deliver lucnhbox meals to me in New York City! Jen, a food blog! This is great. I’m inspired to actually cook something. I want you to start a chocolate blog next. hey cuz! i’ll make sure to post a lot of chocolate goodness for you! 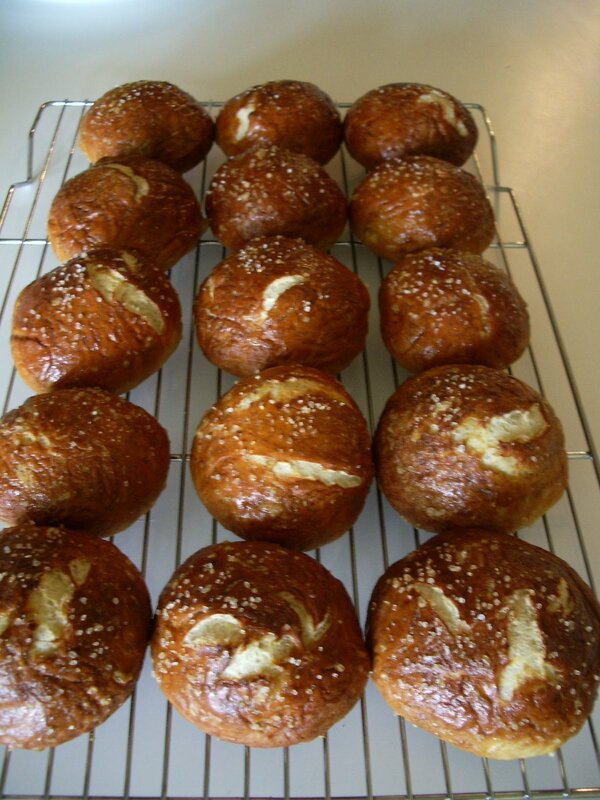 Those pretzel rolls look impressive. These turned out wonderfully for me – thank you!